We left our story (part one) at the point where I (Nikki) was thriving in Young Life ministry, and Andy was struggling. We were newlyweds, but it wasn’t very honeymoon-ish! Although we were best friends, and my respect for Andy’s character and love for the Lord were still intact, I began to wonder what to do with this man who felt discontent and unsure of the next step? I wanted to spend my life with someone who would serve God and live a faith-filled life with me – and Andy was without-a-doubt that man. But at that moment, things were not shaping up how I had hoped or envisioned. And in all honesty, I wasn’t prepared for what to do about it. Regardless of how Andy was feeling about life – I came to realize that I needed to learn a lesson. I was living for me, I wanted “the perfect life”. I believed that marriage would catapult me to a whole new place of happiness, prestige, advancement, etc. I didn’t imagine what sacrifice and service for a thriving marriage would look or feel like. I sure didn’t understand the cost! I recognize now that I was idolizing Andy and looking for him to fulfill my needs. Through our immediate trials, God was teaching me that my spouse didn’t simply exist for me, but that we are a team to help each other along. I was forced to deal with very real emotions of disappointment and anger. But God was forging character. He was giving me a chance to serve, to be compassionate, to slow down, to learn how to truly love another person unselfishly. Ultimately, I learned how to turn to God for my fulfillment, not Andy, and not a so-called “perfect life”. This process wasn’t pretty, (or easy!). And did I mention that it is on-going? I’m still learning! However, the habit of living for another, instead of myself, was becoming an essential ingredient in our marriage foundation. In truth, this heart-change happened because Jesus brought the victory. Aside from God’s intervention, no one can “change themselves” to become a better wife or husband at a heart level. A spouse sees through all that behavior modification. But Jesus changed me from within. Now that is a marriage foundation you can build on! If you’ve known us through the years, you would probably say we have a strong marriage, a united family, and a genuine desire to serve others. You’d be right! However, behind the scenes these 18 years, we struggled and battled and fought to keep our marriage from deteriorating. The journey has often been rough and uncertain. Somehow, we managed to cling to Jesus, and He made the rough roads smooth (Luke 3:4-6) and our weakness into strength (2 Cor. 12:9-10). The challenges of marriage, and the rewards of overcoming them with Jesus, are an important motivation for us in our return to Niger. Here is our story, so you will better understand why we desire to walk with others through the hills, valleys, and plateaus of marriage and family life. It was the Winter of 1994, and I was a new man. I was free! Alive again at 22 years old. Why? For the first time in 10 years, I was released from football. Throughout my life, God had used sports to shape and mold me. Lessons about hard work, commitment, and character were forged. Sports – football being paramount – had given focus to my life, something to pour myself into. Sports’ teams provided excellent friends and influential mentors. Many times, the competition brought me to a place of needing Jesus. With sports came the unknown (“how will I perform?”), and times of being stretched beyond my comfort zone (“will I fail?”). Often, I felt weak and needed someone, bringing me to reach for God’s comfort. At the end of the day, though, my success in sports had become an idol that I could carry no longer. In particular, football was ‘the most important thing in my life’. The pressure I felt was suffocating to the point of despair. Joy and freedom finally came when I sensed God saying to me, “Walk away from all of that. I have something new.” So, happily I marched away with my best friend Jesus. The next two years were invigorating, life-giving! I found joy and could breathe again. I grew in confidence and maturity away from the football field. Jesus was My Everything. I began to spend time with Nikki (whom I had known since our freshman year in college), and our friendship grew. She was in a similar place of joyfully following Christ, and the synergy of our faith deepened our bond. Our mutual desire for an uncommon life-lived-for-Jesus unfolded into a dating relationship, and then engagement. One mentor of ours said something like this, “You two will be an amazing team – you have so few hindrances.” Would this be true? During our engagement, Nikki moved to Eastern Washington to begin work in youth ministry with Young Life. Since I was not rooted in my job at the time, I moved also, to be near her as our wedding day approached. And this is where the “happy” story began to change. I was now in an unfamiliar town, with unfamiliar people, with a less-than-ideal job, feeling stretched and without clear purpose. It didn’t take long to hit an emotional low. I no longer felt peace and security. Instead, I felt weak, average, and discontent. And for Nikki, the new me was confusing, and disappointing. Not exactly a marvelous starting point for our marriage! We will be continuing our testimony, “Behind the Scenes”, here and through our e-mailing list. We’d love to share with you the rest of our story! You can follow this blog by signing up with your email address, or you can contact us to get your name/email address on our email list! We are headed back to Niger! 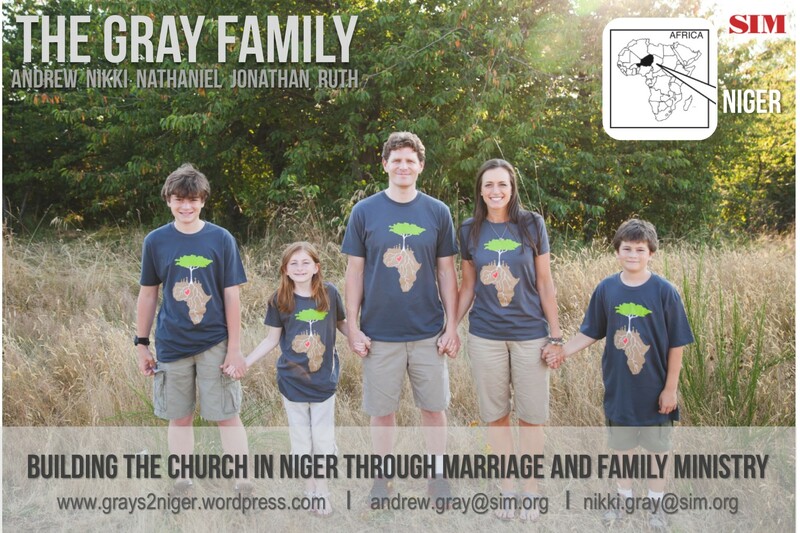 To find out about our ministry in Niger click HERE. To find out about how to give financially to help us get there, click HERE.